Winter is harsh for a myriad of reasons. For our pets, particularly our pups, it can be brutal on their paws. I’ve tried and tested a paw-safe ice melt that helps prevent the cracks and sores that can develop from the extreme cold and of course road salt. But the question I get asked most often is not how to prevent their paws from getting chapped but rather what to do when they are already a problem? 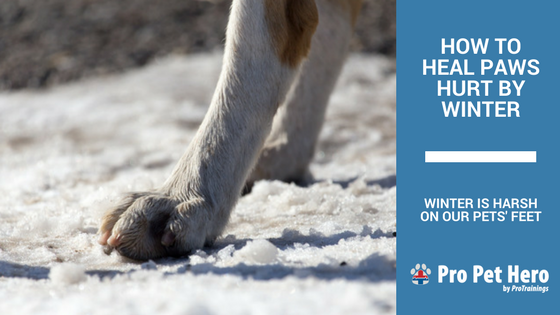 A small split or cut from cold, dry paw pads can quickly lead to something bigger or worse, the dog’s inability to walk due to extreme pain – especially when the road salt seeps in. You literally are adding salt to a wound. Check your pet’s feet regularly. Not just when they come in from the outside but when they’re cozy on the couch, take a moment to really inspect their feet. Have a pup that doesn’t tolerate you touching their toes? Start with training, positive reinforcement is recommended. Start by rewarding your dog (or cat) in small increments for letting you so much as sit next to their feet. Slowly build up over days, even weeks or months just touching gently with one finger, the top of their feet. Don’t push them past their comfort level and reward for each advancement. Start each exercise a step below where you had progressed to and build up their confidence to allowing you to touch their paws. 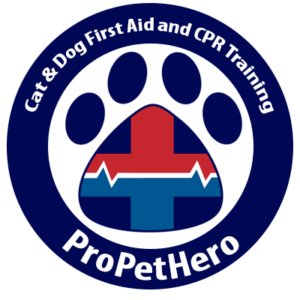 When you find an injury take the appropriate steps, to learn more, take our pet first aid course. The best course of action after learning how to care for the injury is, of course, to prevent further aggravation. In my previous blog post about paw-safe ice melt I discuss booties and balms. Booties are great as a first line defense against the cold, wet and salt. They take some getting used to for your dog but they completely protect your pet’s paws (as long as they stay on). Their other advantage is no more wet paw prints running through the house. However, if you already have an injury, depending on the severity, you may need to wrap it prior to placing a booty on – especially if it is actively bleeding, or looks red and irritated. To help with already cracked pads or even if you notice some other foot wounds, soaking the affected paw in Epsom-salt can help. The Epsom-salt warm water mixture will help to draw out any infection or dirt that will most definitely be settling in. It also feels good to some dogs, others will not be happy to have wet feet! Besides the aforementioned booties, some people also like to use Musher’s Secret, it’s a wax that is applied to the feet to create a breathable protective barrier. It’s made to hold up to the abuse sled dog paws take but I didn’t find it useful for my Boxer’s feet. It’s a popular product so my experience clearly is not the norm. For the pads that are already starting to crack but are not an active wound, try some bag balm, it’s worked wonders for my pups and is safe if licked (looks like they even have a “pet” version now). This winter and actually all year round, make it a habit to CHECK THEIR FEET! I cut my dog’s nails weekly and it’s at this time I go over not just their feet but I check their entire body for lumps, bumps or abnormalities. To learn more about what to look for and how to treat it, take a pet first aid class, your pets will thank you for it.